This past weekend, my buddy Laird invited some of his friends, including me, to his parents' house nestled along the east bank of the Columbia River near Chelan, Washington. I've had a special place in my heart for this valley after living here briefly during the spring of 1999. Fifteen years later, it still takes my breath away. On the north side of the house was a splendid garden filled with summer produce, which always seems to grow more prolifically on the eastern side of the Cascades than in Seattle. We're talking onions for miles, tomatoes for ages, basil for years, and lavender for light-years. On Saturday afternoon, we stopped by the Chelan Farmer's Market to pick up some of the last cherries of the season, grown right here in the Columbia Valley. 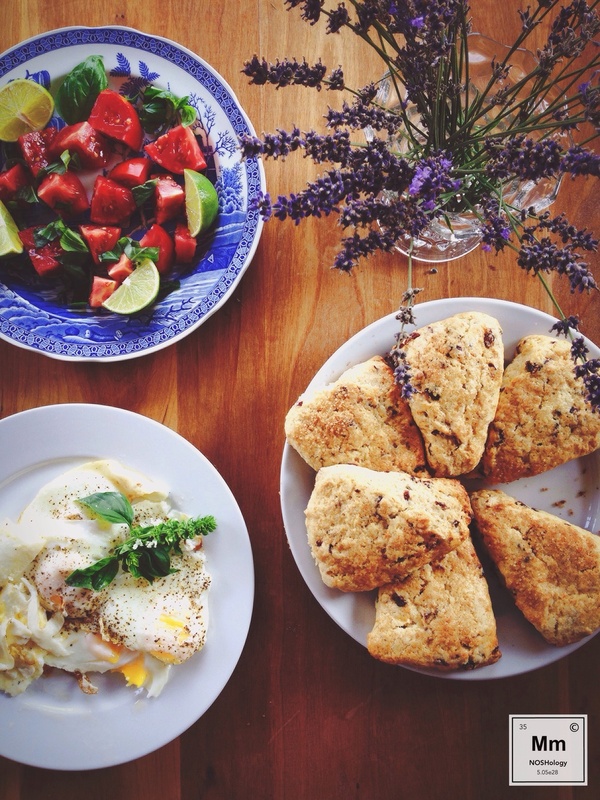 Sunday morning's brunch consisted of a simple tomato and basil salad from the garden, fried eggs, and my famous orange and cranberry scones. Sunday night's dinner remains a secret for now, to be revealed during an upcoming Kitchen Experiments post right here on NOSHology. But I can share with you our last meal before returning to Seattle: a simple Caprese salad with tomatoes and basil from the garden, soft mozzarella, a sweet balsamic reduction, olive oil, sea salt, and fresh ground pepper. We'll miss you while you're away at MIT, Laird. Come back soon!